At 77 Diamonds, The Seven Guarantees are our commitment to giving you the best value for quality diamonds, supported by first-class service. We regularly check the prices of our competitors to ensure that we always offer the best quality for the price in the market. If you see a diamond or a piece of diamond jewellery at 77 Diamonds and you then find the exact same diamond available at a lower price from one of our competitors, we guarantee that we will not just match that price, we will offer you a price that is 1% lower up to a maximum value of £50/ €55 /USD $80 lower*. If you would like to apply the 77 Diamonds Price Guarantee, please email us and tell us the website address or shop where you saw a lower price. In order to prove that we offer great value for money in comparison to our competitors, we regularly conduct research into the prices of similar quality that is on the market. In November 2017, we conducted a mystery shopping trip to a range of high end and high street stores looking for a like for like match to products and GIA diamonds offered at 77 Diamonds. Stores included Tiffany & Co*, Debeers*, Ernest Jones, Boodles and H Samuel as well as online competitors. We found that we are between 49% to 76% better value than all jewellery stores – equating to an average of 66%. * We assume Tiffany and Debeers graded diamonds are equivalent to GIA. The 77 Diamonds Price Guarantee is possible because our diamonds, all of which are conflict-free, come to us directly from the manufacturer that polished them. This enables us to skip out the usual journey of diamonds– from the diamond mine, to the diamond dealer, to a wholesale jewellery store. It also explains why most of our diamonds come with certificates dated only a few months ago. 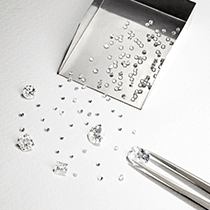 Diamond certificates detail the specifications of a diamond and are an assurance of diamond quality. At 77 Diamonds, we guarantee that each diamond we sell comes with a certificate from one of the five most trusted independent laboratories in the world - the GIA, AGS, HRD, IGI or EGL. You may find some of our competitors produce their own certificates. At 77 Diamonds, we only offer diamonds with certificates from the strictest and most recognised grading laboratories in the industry. At 77 Diamonds we guarantee that on our website we provide the full details for every single diamond in our stock with its precise specification and the source of its certificate. If you are not satisfied with a diamond or piece of diamond jewellery you have bought from 77 Diamonds, you can send it back to us within 30 days and we guarantee we will send you 100% of the purchase price back, no questions asked (see our T&Cs). The item has not had any damage as a result of mishandling or Inappropriate impact (eg. knocks, dents or pressure), and has had no alteration, manipulation, repair or care by a service provider apart from 77 Diamonds or is the consequence of normal wear and tear. 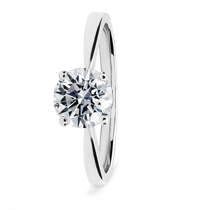 77 Diamonds is pleased to offer the first resize of any ring purchase for free as long as the resize takes place within the return policy range. Rings can only be sized 3 sizes either way from the original size for free. A resize outside of this range will incur a £75 fee (inclusive of VAT). With a showroom in the heart of Mayfair and our workshops also based in Central London, we are extremely proud to be a British company that produces and manufacturers our jewellery within the United Kingdom. 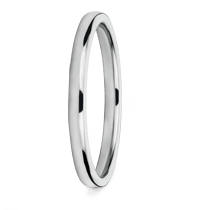 It is for that reason that all our jewellery is hallmarked by UK assay offices.